A highly-charged outing by a top-notch jazz band led by guitarist extraordinaire Michael Bocian. Bocian offers up a challenging blend of driving originals and probing readings of tunes from the jazz repertoire. The band — three of New York's hottest players — accompanies him on his explorations with buoyant enthusiasm and relentless swing. The next great guitar hero? Judge for yourself! 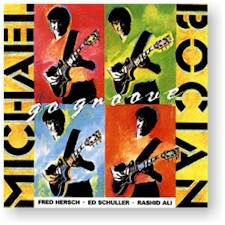 "There aren't too many guitarists who are going to get the better of Michael Bocian's efforts on 'Go Groove." Backed by a fine rhythm section of Ed Schuller on bass and Rashid Ali on drums, the album also features the estimable talents of Fred Hersch on piano." All compositions by Michael Bocian, except as noted. Recorded on 29 June 1989 at Baby Monster Studio.